Fans and critics will reel off their list of tenor players, a list that is as easily changed by fashion as not, and then the musician over in the corner will say, "Yes, but have you heard Hank Mobley?" The musician saying that, in this particular case, might very well be a drummer. The groups Hank works with are often led by drummers--Art Blakey and Max Roach, to name two men who need, as they say, no introduction. In a conversation I had with Art Blakey while preparing the notes for his two Blue Note LPs called Holiday for Skins, he was discussing the fact that while many songs are written in complex rhythms, the solos generally revert to a straight four. His reason for this was that most soloists probably could not play them any other way. "Hank Mobley could do it, though," he said. Everyone knows by now how writers on jazz like to trot out phrases like Hawkins-informed, Rollins-derived, Young-influenced and the like, and then, having formed their pigeon-hole, they proceed to drop the musician under discussion into it and fill the dirt over him. That is not easily done with Hank Mobley. He worked slowly and carefully, in the manner of a craftsman, building the foundations of a style, taking what he needed to take from whom he needed to take it, and finally emerging, on this album, not with a disconnected series of tunes, but with a definite statement to make. Evidence of that . . . is to be found in the care with which this set has been assembled. First of all, there are the sidemen--Wynton Kelly, Paul Chambers, and Art Blakey. To discuss Blakey again on each new record release is almost to insult him and his contribution to jazz, particularly since he says it himself very well, clearly, and with great authority in his solo on "This I Dig Of You." But about Wynton Kelly and Paul Chambers, for a moment. It is probably no accident that both of them are members of Miles Davis's group. Miles has been famous for the superb quality of his rhythm sections as much as for any of his other contributions, and some of the ideas that started in his group or in his observance of Ahmad Jahmal's group are to be found on this record--the best music is never very far from dance. This concept can be found not only in Miles' work, but in the solo albums made by Coltrane, in those of Sonny Rollins, and even in the work of Thelonious Monk, who has taken to doing his own extremely expressive dance in front of his group. This is not to say that any of these men, or Hank Mobley either, "play for dancing," but that the qualities that are essential to dance--a lightness, flow, and flexibility, all within the confines of a definite form and overall sense of structure--are essential to their music. I think also, that dance must be behind as charming, lightly swinging, and immediately attractive a song (song is the right word here, not "tune" or "original") as Hank Mobley's composition "This I Dig Of You," which brings out the best of all the musicians--Blakey's solo has been mentioned before, and I am particularly charmed by Wynton Kelly's solo, with its ever-present echoes of "The Party's Over." These ideas are present, but the four men involved are all excellent craftsmen, so the ideas do not intrude upon the music. You do not think of dance, or rhythmic shifts, or the changing approach to the tenor saxophone, or the old tunes, or the inevitable funky blues. You simply hear, at first, four men swinging lightly, powerfully, and with great assurance and authority. You relax, listen, and enjoy yourself. And then, later, when you think about it, you realize just how much of an achievement this apparently casual LP represents. 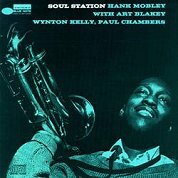 And you think with new admiration and respect about Hank Mobley, because you realize how much of that achievement he has been able to make his own. --JOE GOLDBERG, from the liner notes.